The Surface 2 has a lot of bad history to make up for (not to mention $900 million to recoup), and Microsoft pulled out all the stops. The new table is thinner (8.9mm) and lighter (it's under 680g) with a simpler magnesium build that has only two parts instead of three. It's painted white so that the magnesium looks cooler, says Microsoft. Better yet, it's no longer treated as a second class citizen, but is equal to the Surface Pro 2 in many respects. Most importantly, it gets the same 10.6" ClearType 1080p display as the Pro - the gimped resolution of the Surface RT was a big complaint with iPads and Android tablets posting ever-higher pixel density numbers. Color accuracy of the screen has been increased by "46 percent," whatever that means exactly. The front-facing camera is pretty impressive with a 1/3" sensor - that's as big as most sensors on smartphones (and we're talking high-end here). Plus, it has only 3.5MP resolution, which is great for a front-facing camera but our point is its pixels must be larger than the ones in the HTC One. The camera on the back is a 5MP shooter. 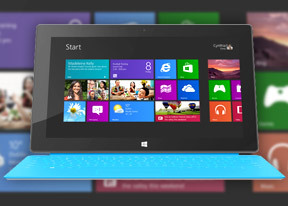 The Surface 2 also has a much more powerful chipset than its predecessor, another thing the RT was criticized about. The Tegra 4 chipset provides enough oomph for the improved multi-tasking that Windows 8.1 RT includes, things like split screen multitasking (and yes, the tablet drops the RT moniker, but the OS keeps it). We're not so sure about the 2GB of RAM though, that's as much as phones get. It was demoed running a game on one half of the screen and an Office app on the other. The presenters were showing off Halo, of course, perhaps the best known Microsoft game. The new tablet also borrows the improved kickstand from its Pro counterpart - it can be set at the previous 22° angle, but it can also be moved to a second position at 40° for taller people. Besides a more powerful chipset, the connectivity has also been improved by replacing the old USB 2.0 port with a speedy USB 3.0 one. Also there are a couple of loudspeakers, one on each side, with Dolby sound tech. The Surface 2 will be up for pre-order soon, priced at $450 for the 32GB version and you'll be getting a ton of goodies for your cash, including a whopping 200GB of SkyDrive storage for a year, as well as free Wi-Fi and international calling with Skype. Microsoft showed off three types of covers for the Surface tablets and you can use them with either the Surface 2 or the Pro 2. Two covers should be familiar from the first generation tablets - the Touch Cover and the Type Cover - but the third one is new, the Battery Cover. The Type Cover 2 is a proper keyboard with keys and everything but Microsoft engineers have managed to get it to only 2.5mm thick. Keys have 1.5mm travel and have backlighting too. The Touch Cover 2 doesn't have physical keys but instead relies on sensors to figure out where your finger landed. Many, many more sensors than the original Touch Cover - the count has gone from 80 to a whopping 1,092. This should improve accuracy and also enables gestures. It will be available in will be available in cyan, purple, magenta, and black and has backlighting too. The Power Cover is similar to the Type Cover 2, but packs a battery inside. 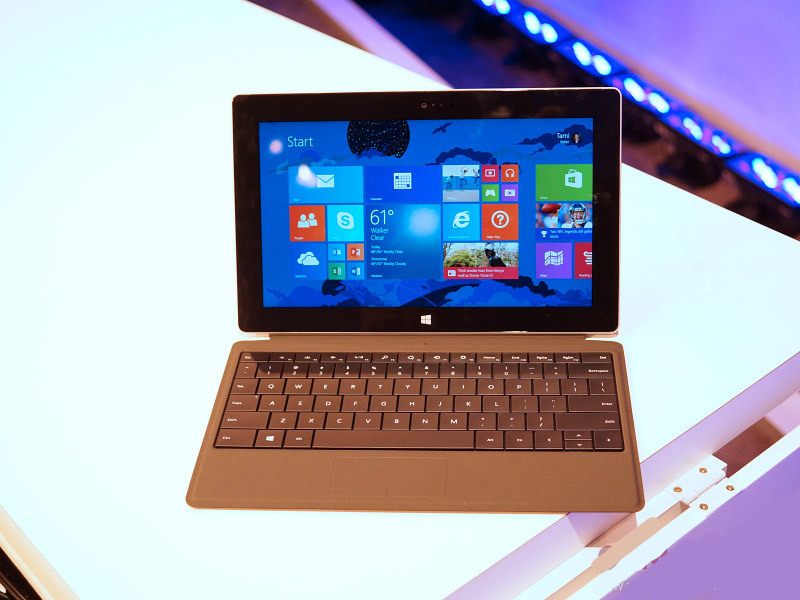 This turns the Surface 2 or Pro 2 into a hybrid laptop in essence. At $200, the Power Cover promises a 2.5x increase in battery life, but won't be available until early next year. Microsoft also showed off a dock that accepts a Surface Pro 2 tablet and adds more ports to it (Ethernet ports, external monitors, keyboard jacks and so on). Finally, there's the Surface Remix project, an attachable cover that targets musicians. This opens up the door for a completely new type of Cover - a specialized cover for an app that is much more user friendly than a regular keyboard where key mappings are arbitrary.